A wooden motor vessel built by G Beattie at Brisbane Waters, NSW, Patricia Cam began life as a tuna fishing boat for Cam & Sons Pty Ltd of Sydney. The minelaying activities of German surface raiders in 1940-41 highlighted the shortage of suitable vessels to keep Australian sea lanes clear of this threat and Patricia Cam was requisitioned as an auxiliary minesweeper. She commissioned on 3 March 1942 under the command of Lieutenant John A Grant, RANR(S). On 8 March 1942 Patricia Cam sailed from Sydney and headed north. Arriving in Darwin on 5 April, she was employed as a general purpose vessel, which included store carrying and in May salvage on the wreck of the American ship Don Isidoro. The transportation of personnel and supplies around the north and north western coastline continued throughout 1942. Patricia Cam was really nothing more than a vast wooden hold with an engine room right aft. The low after superstructure consisted of two cabins, mine and one shared by the engine room artificers (ERAs) and the coxswain, a tiny wardroom mess just big enough to take a table and a couple of benches, and the galley. On the deck above were the wheelhouse and chartroom and the Captain's cabin. Above the wheelhouse was a compass platform and just forward of the wheelhouse was the mainmast. Right forward on the forecastle was a tall foremast carrying the topping lift for an enormous boom which was used for working cargo at the various coastwatching and mission stations around the coast. The wich on the forecastle was driven by a rowdy diesel engine which was also used for weighing the anchor. A point-five machine gun, which swayed from side to side on its mounting, seemed to be something of an afterthought. The ship's company consisted of eight seamen, three stokers, a cook, a steward, a telegraphist, a coxswain and three ERAs they lived in a fairly capacious but cockroach-ridden forecastle. When the tropical rain squalls of the Wet swept over the ship the forecastle leaked like a sieve. The crew, a magnificent bunch clad only in brief shorts and tanned like bronze statues, lived most of their time on top of the huge hatch. 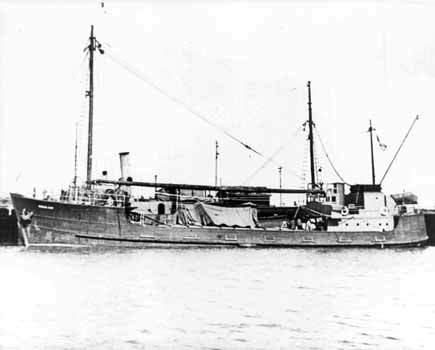 Early on the morning of 13 January 1943 Patricia Cam sailed from Darwin, once again carrying stores and passengers for several outlying missions. On 19 January she left Goulburn Island for Millingimbi Mission. Arriving on the afternoon of the following day she then departed on 22 January for Elcho Island. In addition to her crew she carried the Reverend Leonard N Kentish, Chairman of the Methodist Northern Australian Mission District and five aboriginal passengers. One of the latter, Paddy from Millingimbi, was a native pilot; one of a number of coastal aborigines regularly carried to assist with navigation among the uncharted reefs and shoals. 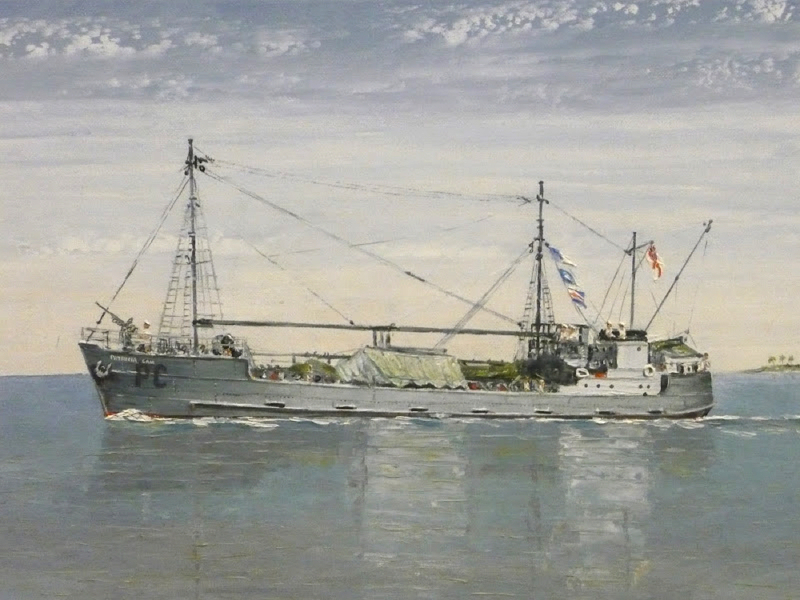 A painting of the ill-fated Patricia Cam by Commodore DHD Smyth, AO, RAN. Enemy reconnaissance floatplanes, based at Dobe in the Aru Islands and colloquially known as 'Floatplane Joe', had for some time been harassing ships along Australia's northern coast. With no radar, ships relied on the eyes and ears of their lookouts for warning. At 13:30 on 22 January, when Patricia Cam was in position 11° 19' South, 136° 23' East on a course for Wessel Island, a plane was seen and heard by several of the ship's company when just on the point of releasing a bomb. The aircraft, a three seater twin-floatplane from the Japanese Naval Air Arm's 734th Kokatai, had dived from out of the sun with its engine shut down, passing over Patricia Cam from stern to stem at no more than 100 feet above the mast. The bomb landed amidships in the centre of the cargo hatch and exploded in the bottom planking. Patricia Cam sank within a minute. Several members of the ship's company were sitting on the forward hatch when the explosion occurred and were thrown down the hold but were almost immediately washed out again by the inrush of water. Both ship's boats were destroyed but the life raft remained intact. One sailor, Ordinary Seaman Neil G Penglase, went down with the ship. While the survivors were bunched in a small area the plane returned and dropped its second bomb, killing AB Edward D Nobes and two of the aboriginal passengers. The plane then continued to circle for about half an hour, the rear machine gunner regularly firing into the scattering survivors, but without scoring any hits. The plane then flew away to the northward, but returned five minutes later and alighted on the water. One of the crew climbed out and beckoned for someone to swim over. No one accepted the invitation and the plane taxied in a circle closer to where Mr Kentish and a rating were resting on some floating hatch covers. Threatened with a revolver, Mr Kentish was ordered to swim over to the aircraft and after a brief conversation he was taken on board. The plane thereupon took off and finally disappeared to the north. After the departure of the plane the injured were placed on the raft, while most of the remaining survivors gathered themselves together. However two sailors, Ordinary Seaman Andrew A Johnston and Chief ERA William R Moffitt, remained at some distance still clinging to hatch covers. Either unwilling or unable to swim to the remainder, they were not seen again after nightfall and were presumed lost. The main group of survivors attempted to reach Wessel Island, but were unable to make headway against a strong current which swept their raft south. After a hard pull with makeshift oars the 18 survivors landed on a small rocky islet about two miles west of Cumberland Strait at 03:30 on 23 January. Stoker Percival J Cameron died of his injuries later that morning, as did another of the aboriginals later in the day. Survivors of Patricia Cam at Darwin. Paddy and the other surviving passenger succeeded in lighting a fire within a few minutes of landing and this was kept going to attract attention. There was ample fresh water but the only food was provided by shellfish and an edible root shown to them by the two aborigines. 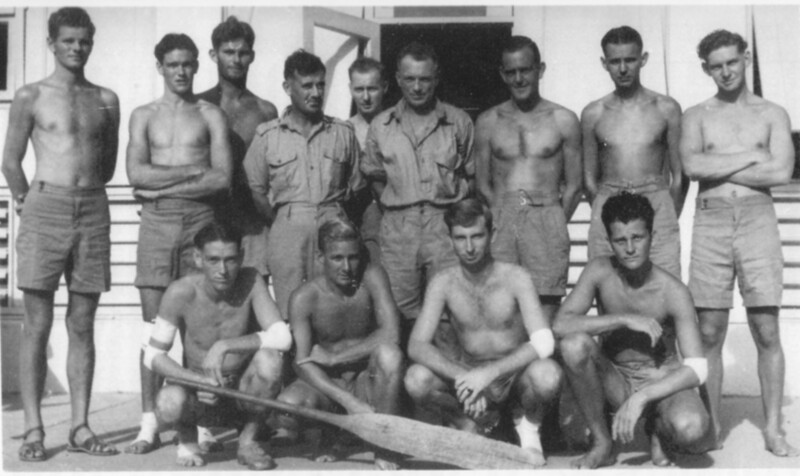 On the morning of 25 January a party of natives from Wessel Island arrived by canoe and took the commanding officer, Lieutenant AC (Sandy) Meldrum RANR(S), to seek aid. Although well supplied by his rescuers with food and water, he faced an agonising 35 mile march through the rock and scrub country of Wessel Island in bare feet. He staggered into the Coastwatching Station at Jensen Bay at 21:00 on 26 January. Already, however, a RAAF Beaufort bomber from No. 7 Squadron had sighted the box raft drawn up on the beach and the frantically waving survivors, who had written in large letters on the sand: 'PATCAM - Bombed - No Food - Plenty Water". Food and a first aid kit were dropped off the following morning. 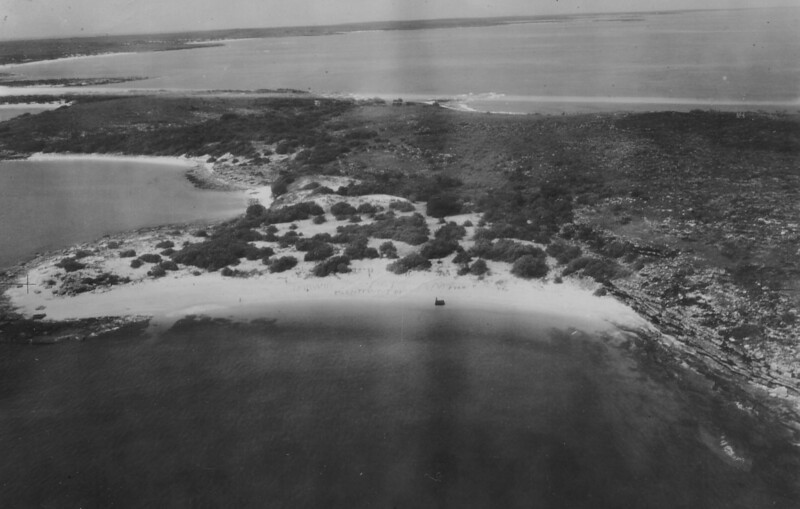 The survivors were rescued by HMAS Kuru on 29 January and returned to Darwin two days later. Patricia Cam beach message which read, 'PATCAM - Bombed - No Food - Plenty Water'. Reverend Kentish's fate remained unknown until after the war. Investigations by the Allied Occupation Force in Japan revealed that he had been held prisoner at Dobe until 4 May 1943 and then beheaded. Interrogations of former Japanese naval personnel eventually revealed that Sub Lieutenant Sagejima Maugan had carried out the execution. Following his arrest and trial this officer was hanged at Stanley Gaol, Hong Kong on August 23 1948. 'Trying To Be Sailors', John Leggoe, Perth, St George Books, 1983.